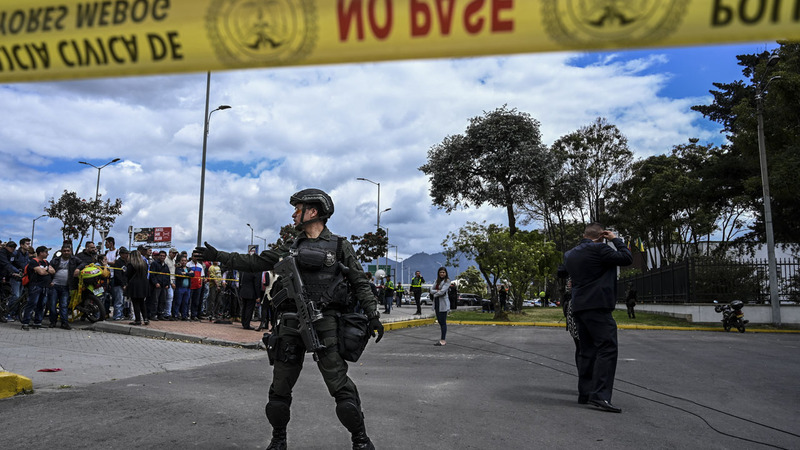 Colombia’ s government declared three days of mourning after at least 21 people died in a car bomb at a Bogota police cadet training academy, and 68 were wounded — the worst such incident in the city in 16 years. Authorities said they identified the bomber and that he had no known links to armed guerrilla groups. The defense ministry said the “terrorist act” was carried out using a vehicle packed with 80 kilograms (around 175 pounds) of explosives. “Unfortunately, the preliminary toll is 21 people dead, including the person responsible for the incident, and 68 wounded,” Colombian police said in a statement, adding 58 of those injured had been discharged from hospital. “All Colombians reject terrorism and we’re united in fighting it,” President Ivan Duque tweeted in the aftermath. Later in a statement to the nation, he said he had ordered reinforcements to Colombia’s borders and routes in and out of cities. The bomber — who authorities confirmed was killed in the attack — struck at the General Francisco de Paula Santander Officer’s School in the south of Bogota during a promotion ceremony for cadets. He said the truck underwent an inspection in July in the Arauco department on the border with Venezuela — a traditional stronghold of ELN Marxist guerrillas. Carol Oviedo said her brother Jonathan, a cadet, told her on the phone he had been injured, before the connection was cut. “In two years since he joined the police, he’s never had to face a situation like this,” she said. Like other families, she was lingering in the vicinity of the academy hoping to hear some news. Rosalba Jimenez, 62, was opening her confectionary store near the school when the bomb went off. “When we turned to look at the school the sky was grey with smoke. People were running, sirens… horrible, horrible, it seemed like the end of the world,” Jimenez told AFP. Authorities sealed off the area to the press and increased security service patrols in the south of the city, AFP reporters said. Right-wing Duque, who assumed power in August, has peddled a tough line against Marxist rebels and drug traffickers in the largest cocaine producer in the world. Peace talks with ELN guerrillas — who in the past have claimed responsibility for bomb attacks on police — stalled before Duque replaced Juan Manuel Santos as president, and have not been restarted. Duque has made several demands, including the release of all hostages, as prerequisites to kick-starting the peace process, but the ELN has dismissed those as unacceptable. That cycle of violence has also involved paramilitaries, drug traffickers and other Marxist rebels, including FARC dissidents. In February 2017, the ELN claimed responsibility for an attack on a police patrol in the Macarena neighborhood of Bogota that left one officer dead and several seriously wounded. In June, three people — including a Frenchwoman — were killed and nine others wounded in an attack on a Bogota shopping mall that authorities blamed on a fringe left-wing group called the Revolutionary People’s Movement (MRP).